For some people industrial building is like an art piece ready to be renew, which is why people start to use industrial home décor as their interior theme. Although usually this theme is applied on old barn, warehouse as well as other industrial building but now this style also takes storm towards house interior design. Especially since this style has unique detail which makes it really interesting such as industrial fixture and machinery. Rustic items and unfinished design really brings out the manufacturing and mechanical element to your house interior design. Let us start to transform your urban house to more stylish and trendy living quarters that you might love with this industrial style. The industrial theme used a lot of iron and steel items which originated in the era where iron and steel are produced in the US and used all over the world. This is why to apply this style inside your house; you must use several rustic metal items around your house such as lighting fixture, rustic metal hardware on the furniture, plumbing for curtain and shelf, even old metal items and many others. Use brushed nickel, wrought iron, cast iron, copper and other rustic metal items as your industrial home décor. On those rustic metal items that you use as industrial home décor some must have some mechanic inside. In industrial era mechanical items is very popular since people are curious on how the mechanic work to run the machine. That is why some of them are exposed so we could really see the mechanical system inside. Use this exposed mechanical items inside your house to really apply the unique theme inside your house. By using those items, it will really change the feeling of your house interior dramatically. Concrete has been used as the industrial era structure a long time ago, that is why when people who want to apply industrial home décor theme inside their house build the building the first time, they tends to leave the concrete part of their house unfinished as decoration. Some also create concrete structure inside their house such as permanent shelving, bench, or table. But since they are all permanent sometimes it gives some trouble in the future. 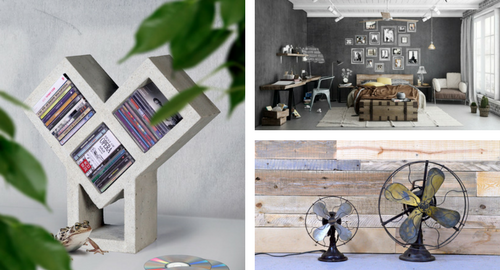 Luckily in our modern world there are a lot of items which inspired by those concrete structure so they are made with concrete but it is a portable items which you could move easily. Try to add several concrete accent items to your industrial house interior to give nice feeling for it such as table, bookshelf, vase, candle holder, and many others. Since this industrial theme used to be use inside old barn, old warehouse and old industrial building they have unique background. That is why you also need to choose your background to match the real background that they have in the real building to your own house. Of course you do not need to build your house wall from scratch just to apply this style since there are faux wall finishing which you could apply to get the same appearance as that old buildings. Industrial home décor background that you could use is concrete wall, unfinished brick wall, and old barn wood wall. Lastly you must try to use industrial home décor furniture that suitable for this style. Most of the time the furniture would be made from wood and metal which unfinished or rustic. You can also use reclaimed furniture as one of your way to decorate your house with industrial theme. Leathers sofa also suitable for this theme as long as they have natural earth tone which could match well with the surrounding. Of course that does not mean you could not use modern furniture since you could still mix your modern piece with the old piece so they could blend together. Applying industrial theme inside your house is actually very easy. All you need to do is to think about raw and unfinished appearance and apply it inside your house. That also works when you choose items to put inside your house so try to choose items with rustic, unfinished or refurbish appearance to decorate your house. If you do not want the industrial feeling to be too heavy and take out your entire house you could still insert several modern pieces here and there but make sure that it is still suitable for the industrial theme. For example you should not put items with plastic material since it is not suitable with industrial theme but you can still use it if it has dark rustic metal faux finishing. So really just use your creativity when you want to use industrial home décor.